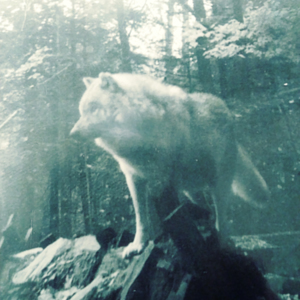 This photograph depicts a wolf at the lobo wolf park, located along Route 6 five miles east of Kane, PA. 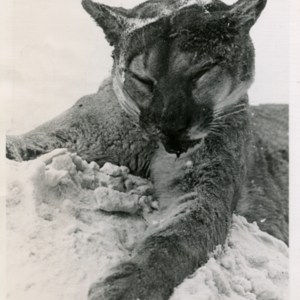 They were donated by Dave Smith, whose father Harry Smith took the photo in Kane, PA while he was on a deer hunting trip. 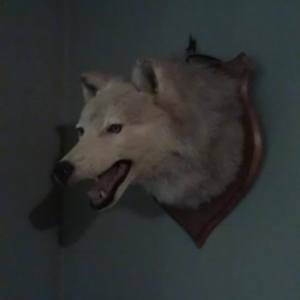 A wolf head taxidermy of one of Dr. McCleery's wolves owned by Steve Martin, whose grandfather Bill Martin was a game warden and sheriff while the wolves were in Kane. 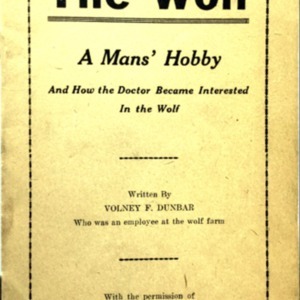 This book by Volney F. Dunbar, who was an employee at Dr. E. H. McCleery's wolf farm, answers questions from visitors and was written with permission from Dr. McCleery. 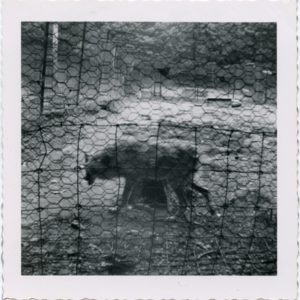 This photograph depicts a wolf in a pen at Dr. McCleery's lobo wolf park, located along Route 6 five miles east of Kane, PA. 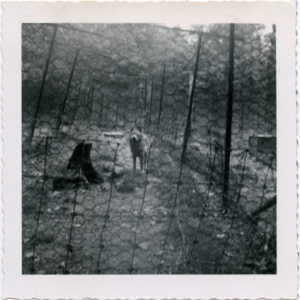 This photograph depicts two wolves in a pen at Dr. McCleery's lobo wolf park, located along Route 6 five miles east of Kane, PA. 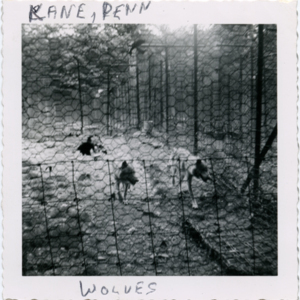 This photograph depicts two wolves in a pen at Dr. McCleery's lobo wolf park, located along Route 6 five miles east of Kane, PA. "Kane, Penn Wolves" is written on the photograph. 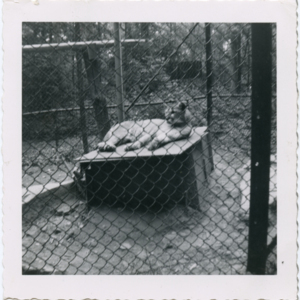 This photograph depicts a mountain lion in a pen at Dr. McCleery's lobo wolf park, located along Route 6 five miles east of Kane, PA. 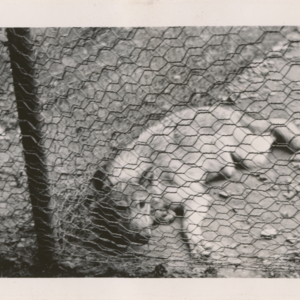 This photograph depicts a wolf lying down in a pen at Dr. McCleery's lobo wolf park, located along Route 6 five miles east of Kane, PA. 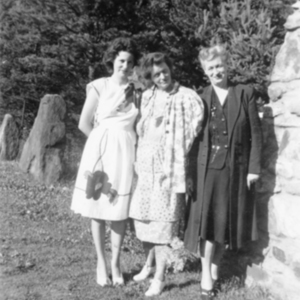 This photograph is from a 1939 photo album. 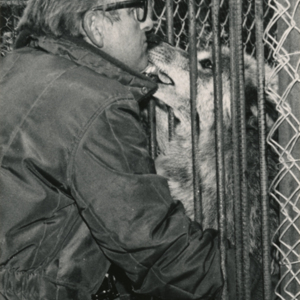 This photograph depicts Jack Lynch with a wolf at Jack Lynch's "Loboland USA" buffalo wolf preserve, located in Gardiner, WA. 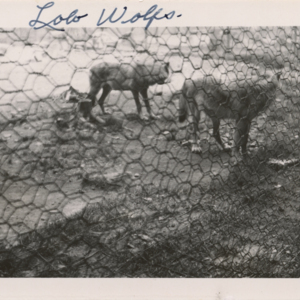 This photograph depicts two wolves at Jack Lynch's "Loboland USA" buffalo wolf preserve, located in Gardiner, WA. 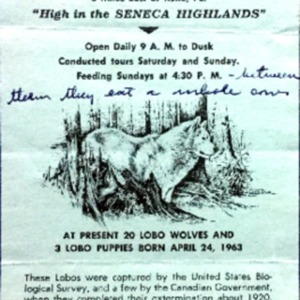 The full caption on the back reads, "Above: Shortly after feeding, these wolves bedded down. 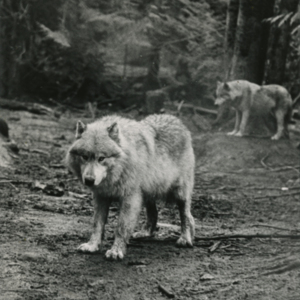 Left: It is not easy to stare a wolf down, particularly when it doesn't know you." 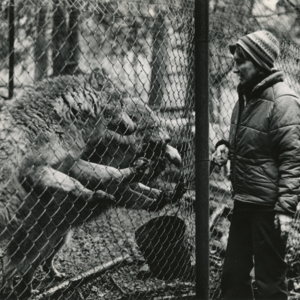 This photograph depicts Marjorie "Margie" Lynch feeding the year-old wolves at Jack Lynch's "Loboland USA" buffalo wolf preserve, located in Gardiner, WA. 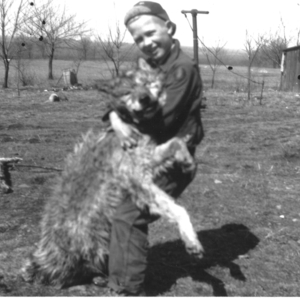 This photograph depicts John Carl Erickson holding a dead wolf from Dr. McCleery's lobo wolf park. 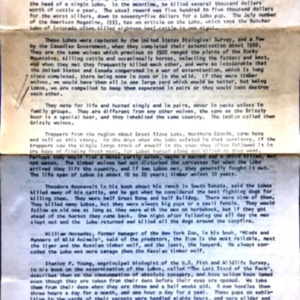 The wolf had been shot at Dr. McCleery's request by Allen "Al" Fitch (a relative of John Carl Erickson). 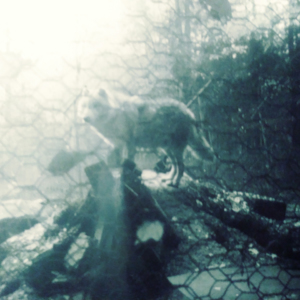 Another dead wolf is lying on the ground. 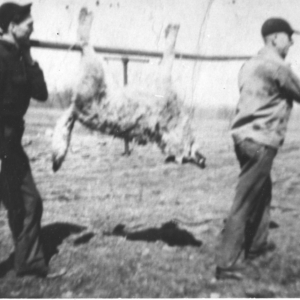 This photograph depicts Allen A. Fitch (left) and his father Lawrence Burlingame Fitch (right) carrying a dead wolf from Dr. McCleery's lobo wolf park. 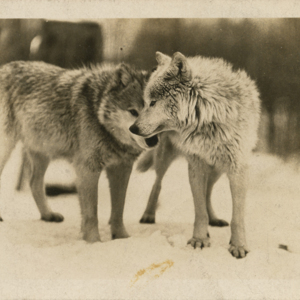 The wolf had been sick and was shot at Dr. McCleery's request by Allen Fitch. This photo was printed on Kodak postcard paper.